Peniston Woolley known by his second name Thomas was born in Paddington, London around 1899. 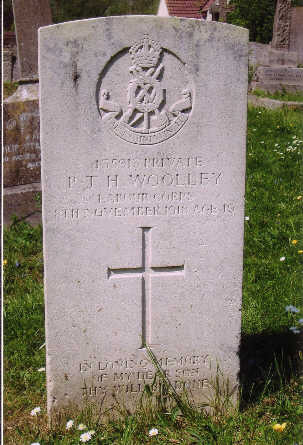 He was the only son of Peniston and Agnes Emma Woolley. In 1901 the family were living in Paddington where his father was employed as a draper’s assistant. The family later moved to Great Cornard and lived in The Pot Kilns. Before enlisting Thomas was employed as a gardener’s assistant by Mr. C King, a report in the Suffolk and Essex Free Press on 29th March 1916 tells how he was called to give ‘evidence of identification’ on the sudden death of his father in the Five Bells public house, Great Cornard. Thomas was a member of St. Andrew’s Church Choir. He was described in the Suffolk and Essex Free Press as ‘a general favourite and of a refined and retiring disposition’. Thomas died in a military hospital in Leicester from influenza on 8th November 1918 only 3 days before the Armistice. He was aged 19. His funeral was held at St. Andrew’s Church and he lies buried in St. Andrew’s Churchyard, Great Cornard. It is estimated that more than 70 million people throughout the world died from the influenza pandemic of 1918, which is more than all the casualties from the First World War worldwide.